﻿Parking lot striping in Frisco, TX is a big deal when it comes to keeping up with your competition. Frisco is a city on the rise in the northern burbs of Dallas, currently attracting more and more business and growing daily. Frisco, Texas is an affluent city that has been booming since 2000, and the growth doesn’t seem to be slowing down. Now home to many retail establishments, churches, and several major sporting venues. Frisco is also considered home for many professional and minor league teams’ corporate offices. Just to name a few, Frisco is home to The Dallas Cowboys, The Dallas Stars, FC Dallas, Frisco RoughRiders, Texas Legends, and The Southland Conference. 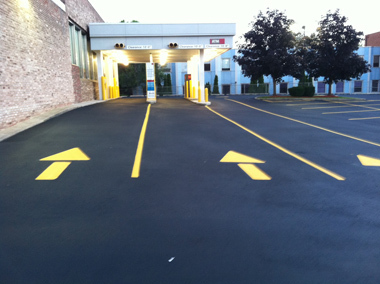 With so much competition on the rise, you as a business owner want to make sure your parking lot is in tip-top shape. You only get one chance to make that very first impression for your customers, and it all starts when they drive up into your parking lot, or parking garage. Freshly painted stripes, fire lanes, handicap stalls, loading zones, no parking zones, and directional arrows all shows your visitors that you care about their safety. When your parking lot is laid out correctly the traffic flows nicely, and vehicles can safely park without causing damage to your property or other visitor’s property while on your lot. We love having the responsibility to help keeping Frisco beautiful, and current. We take our job very seriously, and providing your business with a perfect looking parking lot is what we do best. 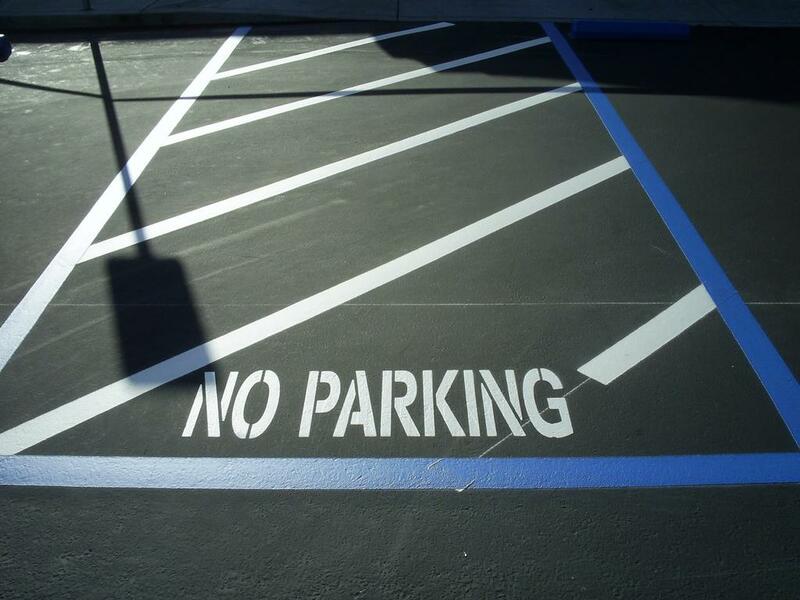 We hope that when it comes time to re-stripe your parking lot, we are the team you call on to get the job done correctly, on time, and on budget. We use the latest technology, and the best products in the business to make sure your parking lot looks professional, and to ensure your investment will last. We paint with consistency, meaning the paint color and width are always consistent. We also paint the straightest lines in DFW. No matter if your parking lot is asphalt, or concrete, we have got you covered, and will use the right tools and materials for the job. There is no job too large or too small for our team. We treat every job with the utmost importance, so in the end you have the finest looking parking lot in town. We also do pressure washing (aka power washing), and will discuss with you how pressure washing can help prolong the life of your parking lot. As with all things in life that get dirty, proper maintenance is required to prevent costly repairs in the future. Parking lots take a beating with oil, dirt, grease, grim, and all types of fluids that can leak from vehicles. Properly cleaning up those types of spills are a necessity at some point in the life of your parking area. Have you fallen victim to graffiti? It happens from time-to-time even in the most affluent of areas. Never worry, we can help by cleaning it up for you. We are trained experts at removing graffiti and can come in quickly to remove the damage caused at the expense of others. Simply give us a call today. We know all of the city and county codes for every location in Frisco, and will make sure your parking lot is compliant for all American Disabilities Act (ADA) regulations, and also make sure your lot meets all fire and emergency regulations. We make it a point to ensure you understand all of these codes as well so you are never caught off-guard with compliant issues. 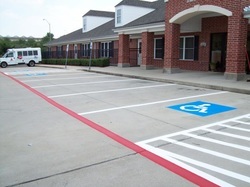 ​If you are a business owner, and know you need to have your parking lot re-striped please contact us today. We do offer the most competitive prices in the entire Dallas / Fort Worth Metroplex, and we want to work with you today. Dallas, Addison, Allen, Carrollton, Celina, Coppell, Fairview, Farmers Branch, Forney, Frisco, Ft. Worth, Garland, Heath, Highland Park, Prosper, Irving, Lewisville, Lucas, McKinney, Mesquite, Murphy, Parker, Plano, Prosper, Richardson, Rockwall, Rowlett, Sachse, The Colony, University Park, Wylie and Surrounding areas. If you are not located in one of these cities listed above, we can still help you with your parking lot striping project. Give us a call or email us and we can work out the logistics and give you a quote.